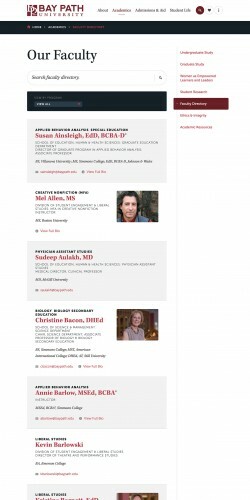 Bay Path University underwent an enthusiastic period of growth and academic realignment as its dynamic leadership team addressed shifting tides in higher education. 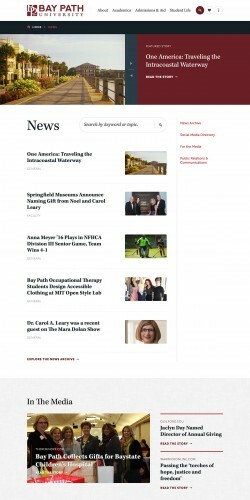 The Bay Path online presence was fractured across websites with different designs, interfaces, and information. 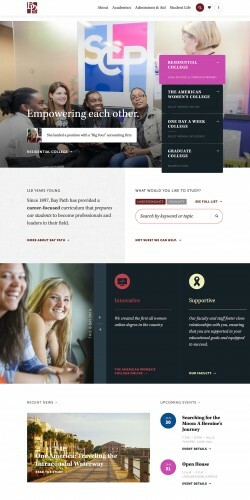 The lack of cohesion made it difficult for users to see the the full picture of the University's many offerings, which shaped a diverse and supportive curriculum for women of all ages and walks of life—from traditional undergrads to professionals looking to grow to adult women seizing the opportunity to change their lives for the better. 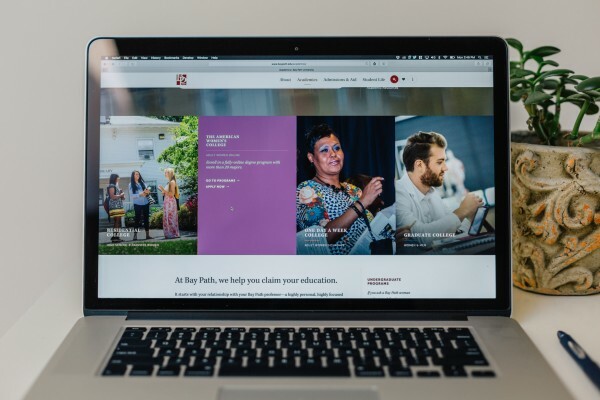 Fastspot's team refocused the strategy, design, and messaging back to the core brand of Bay Path. 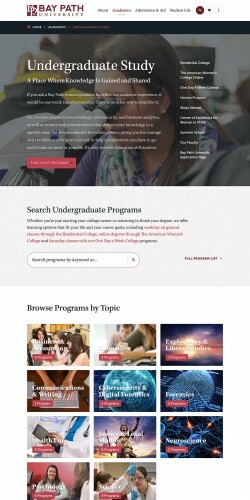 By streamlining the site structure to provide clear pathways to key information for each audience and creating helpful tools to find and apply for the diverse on-campus and online offerings, the new website is now able to cater to and support all of the University's target audiences. 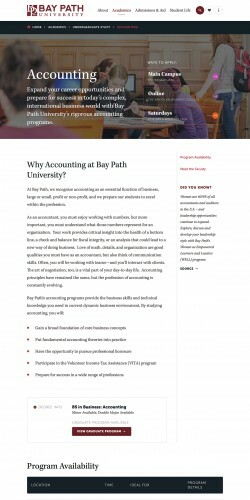 A major challenge of this project was to create a site with a cohesive brand identity, while taking care not to completely eliminate the established secondary palette with which each of Bay Path University's four programs is identified. 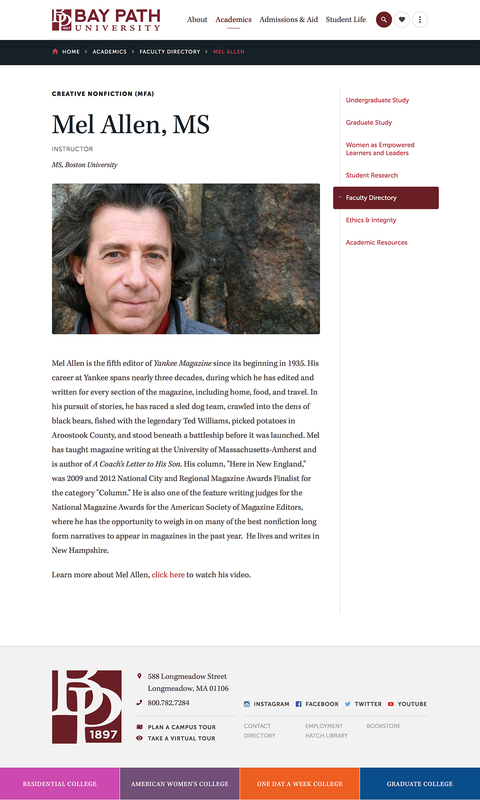 This was achieved through a site design that relies more heavily on neutral whites and grays, and that uses the primary brand color, maroon, as more of an accent throughout. This approach allows for a more harmonious and meaningful incorporation of the secondary palette, and keeps the overall site design firmly within the overarching Bay Path brand. 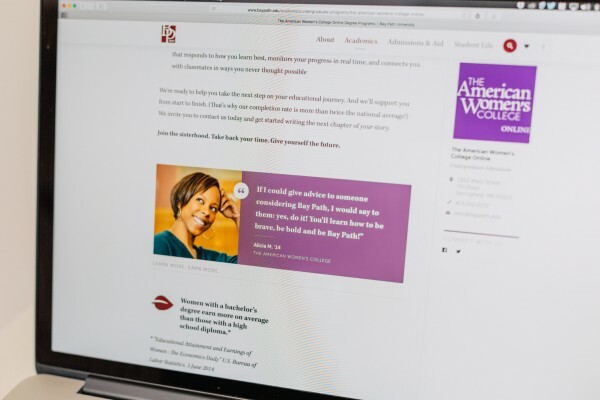 With four programs, each catering to specific audiences, another challenge was to clarify the wide range of academic offerings and the audiences to whom they apply. 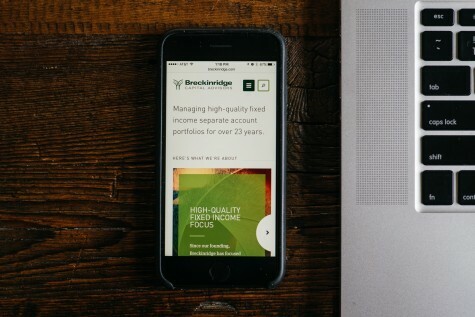 This content was designed directly into the homepage feature in a way that demonstrates the appropriate audience through photography and written content, and gives the user clear navigational paths to find the information relevant to her. 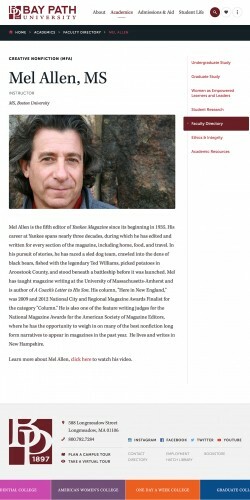 Deliberate use of the secondary color palette on the homepage and subpages adds additional clarity to the relationship between content and audience throughout the site. Bay Path prides itself on its warm and welcoming nature. 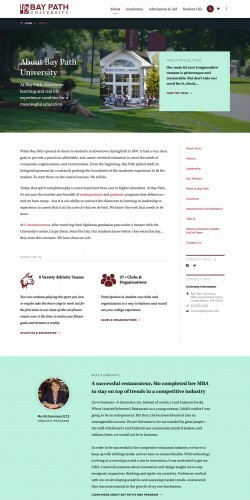 We wanted to create an online experience that mirrors the hands-on, caring personality of the faculty and staff at the University. 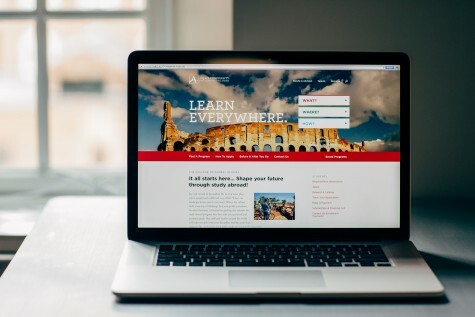 Authentic photography and student stories, supportive language, and strategically-placed, helpful cues lend a sense of warmth and support to the site that helps guide the user without ever feeling condescending or overbearing. 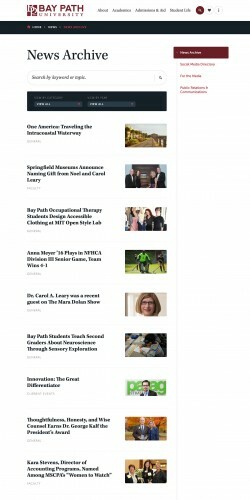 Implementing a new CMS to facilitate content maintenance was another major initiative of Bay Path’s website redesign. 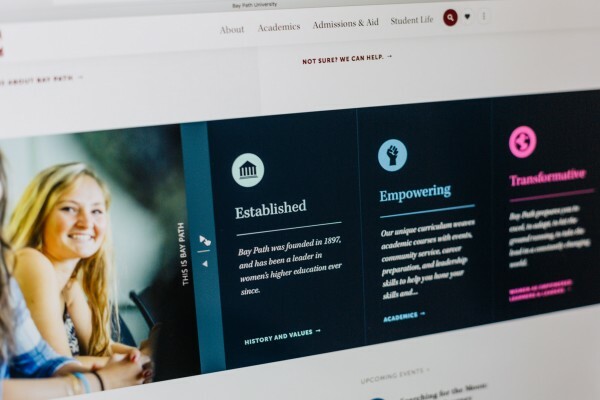 By using BigTree CMS to power the new site, the ability to update content was opened up to a wider audience, allowing Bay Path’s faculty and staff more opportunity than ever before to share stories and update pertinent content in a timely manner. 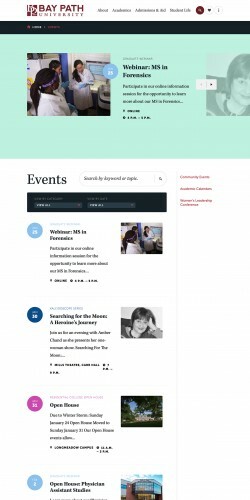 This CMS implementation was especially helpful in leveraging social media and events content throughout the site, which encourages community participation and better showcases campus life.